The Feast of Saint Grady Louis McMurtry – Zero Equals Two! 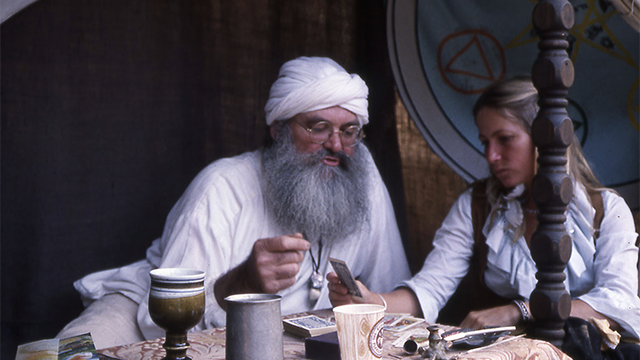 Tomorrow, July 12, will be the 33rd anniversary of the Feast of Major Grady Louis McMurtry, Gnostic Saint and first head of Ordo Templi Orientis following the death of Karl Germer, who celebrated his Greater Feast without specifying a successor. Born October 18, 1918, in Oklahoma, McMurtry met Aleister Crowley while serving with the US Army during World War II, and was initiated into the IXth Degree of O.T.O. in 1943. He led a revival of O.T.O. in the 1970s and 80s. In honor of McMurtry’s Feast in the sign of Cancer, please enjoy this recipe from The Novice Chef. Please note that you’ll want to use canned oysters, as fresh oysters aren’t in season this month or next! Preheat oven to 400°F. Butter or grease two 6 oz ramekins. In a small bowl, stir together oysters, garlic, cajun seasoning and black pepper. Divide oysters among prepared ramekins. In a small bowl, combine melted butter, bread crumbs, parmesan cheese, parsley and thyme. Top oysters with bread crumb mixture. Bake for 10 minutes, or until warmed through and bread crumbs are lightly toasted. Why not serve the oysters with this Berkeley sourdough bread? Want to learn more about Saint Grady Louis McMurtry? The Grady McMurtry Project hosted by Blazing Star, O.T.O.